Greetings VAPA students, faculty, staff, and friends! What a wonderful weekend of performances and exhibitions this past weekend, featuring VAPA students and faculty! Starting with the art exhibit Friday night at the President’s Holiday Reception at Sesnon House, through jazz performances featuring world-renowned guest trombone soloist Bill Watrous, through sold out Music for the Feast performances at Holy Cross Church in downtown Santa Cruz, and ending with dance and youth strings performances yesterday, VAPA faculty and students never cease to amaze! Congratulations to all, and be sure to tune in to even more great performances this week and coming weekend! See list of upcoming events, below, and visit www.cabrillovapa.com for more info and ticket information! Kudos Department – Art Program Chair Tobin Keller selected for Gail Rich Award! Cabrillo College Art Program Chair and Faculty Member Tobin Keller has been selected as a Gail Rich Award recipient this year! This is a HUGE honor for Tobin and a recognition of the excellence of all of programs in VAPA, especially the visual arts! We’ll look forward to this being blown out in the press this January…and to the award ceremony at the Rio in late January! How fitting that this award, designed to showcase the very best in the county’s artistic community who exemplify the restless spirit of the creative life, would be bestowed on Tobin Keller, a highly valued member of our art studio faculty! Gail Rich was a writer, radio programmer and volunteer who, with her boundless curiosity and artistic appetites, represented the best part of our community. She died suddenly in 1996, the year the Gail Rich Award idea was conceived, and it is with honor that Santa Cruz attaches her name to a celebration of the community she loved so much. Enjoy this NY times article on retiring Dean of the Tisch School of the Arts at New York University. She underscores the centrality of the arts in education as a critical and essential tool for the development of all human beings’ full creative and imaginative potential. Her school has also recently launched a combined MFA-MBA, addressing the need for artists to develop their entrepreneurial skills, as well as their artistic skills. For Mary Schmidt Campbell, who is retiring as dean of the Tisch School of the Arts at New York University, there is plenty of unfinished business in the field of arts education. Community Forum on New State Mandates and Their Impacts on the Arts Slated for the Watsonville Center this week! Come find out more about new State mandates about repeatability, and pending changes to non-credit arts classes, this week at the Watsonville Center of Cabrillo College on Wednesday, December 11, from 5-6pm, in the Solari Center, Room D101. Come learn about how Cabrillo intends to provide good local solutions to State-wide challenges, and continue to serve all in our community with robust, world-class education in the arts! 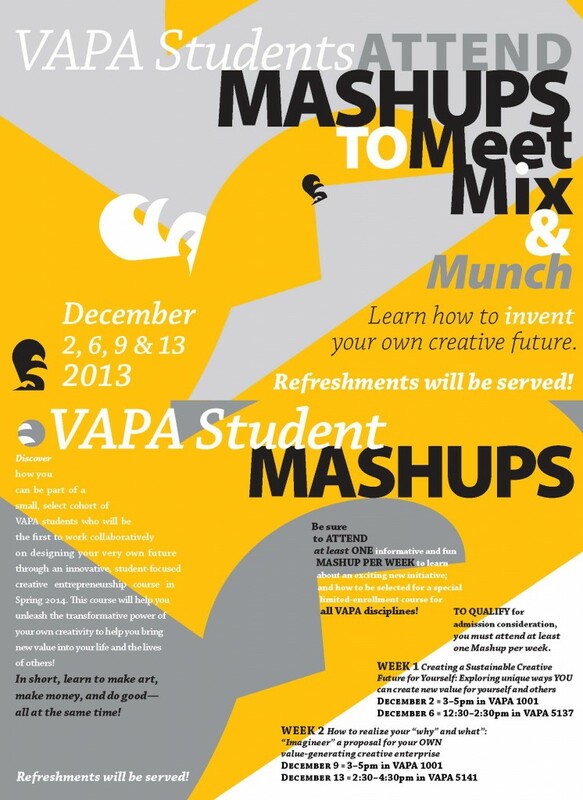 VAPA Student Mashups Exploring Ways to Imagineer YOUR creative future continue TODAY and Friday! The VAPA creative entrepreneurship mashups continue this afternoon at 3 in VAPA 1001, with a repeat Friday at 2:30pm in VAPA 5141. Check out the SPICE rack for the PowerPoint presentation shared at last week’s mashups for more information on this new initiative. Theatre Arts Department Directing Extravaganza!